Love The Monstrous Fries By The J? Try 'Em All At Their New Outlet! After a great run at Viman Nagar and Balewadi, The J with its assortment of crazy fries, is finally opening in the most happening neighbourhood of Pune, Koregaon Park. Now, it’s no news that we absolutely love The J. 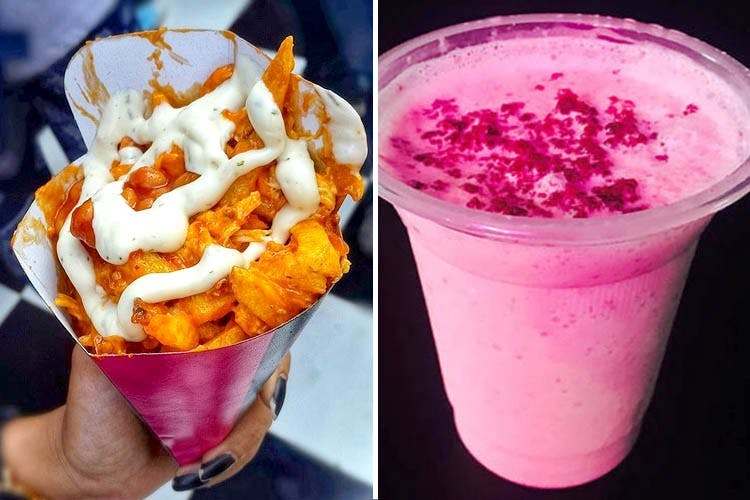 From their schezwan cheese fries for INR 110 to fried Maggi fries with mayo for INR 140 and chicken burrito fries for INR 180, there are over 20 variants of amazing, lip-smacking fries to choose. The new outlet will be opened at Vrindavan Building in Lane No.6, Koregaon Park and will feature the exact same menu as the last two outlets. So dig in to those tandoori chicken fries and battered fried fish fries like a boss. You can also make your own fries at The J. All you have to do is pick your base. Choose your add ons from a range of mozzarella cheese, crushed tortillas, beans, sour cream, cheese poppers, chicken sausages, nuggets and chicken popcorn. You can also add your favorite sauces including chiptole, garlic mayo, tartar and more. Head to the brand new outlet of The J and don’t forget to share your recommendation with us!